Markets not only continued to defy gravity, the ascent accelerated! Allan Roth: US stocks will return between -21.7% and +34.7%; international stocks between -26.4% and +42.4%. Thanks Mr. Roth. Did you really want your name next to these bold predictions? Jeffrey Gundlach: a good record on interest rate direction believes long-term US Treasury rates will hit 6% by the 2020 election; and the US stock market is headed for a fall. Trump will be impeached not for Russian collusion, nor for money laundering, nor obstruction of justice, but for Tweets beyond the 280-character limit. The point is, market predictions at best have coin-flip odds of being right. We don’t know short-term direction and we can’t control the outcome, but you can control your goals and your exposure to risk. So, thinking about a 25% decline in your money may help you maintain perspective and make changes if needed. All asset classes in the table above were positive in 2017. Stocks had an outstanding year, well above long-term average gains. International stocks made up for lost ground over the past 3, 5, and 10 years, with emerging markets leading the way up 38%. Commodities showed signs of life as inflation increased almost a full percentage point over 2016. Copper is known as the commodity with a PhD in economics because it’s sensitive to supply and demand factors rose almost 30%. Income generating assets like REITs and bonds delivered reasonable gains, despite the prospect for rising interest rates. Rising rates tend to impact asset pricing, but bonds and REITs tend to re-price first, while investors gauge the risk return tradeoffs of bonds vs. stocks. That is, does it make sense to buy expensive stocks, when bond rates increase? Higher rates also mean housing and auto affordability declines which moderates their price increases. The benchmark US 10-year Treasury bond has been trendless, ranging between 1.5%-3.0% over the past five years. If rates break out of this range it would likely put downward pressure on most asset prices. By how much? Depends on the speed and slope of the rise. Investors ignored dire headlines: North Korean missile threats, President investigations, hurricane devastation, and a growing national deficit. In fact, 2017 was one of the smoothest investment rides in the past century. In October, the S&P 500 index broke its record of consecutive days without a 3% drawdown. The biggest single-day drop in 2017 was just under 2%. Already the second longest bull market in history: how long can this calm rise continue? The Great Melt Up Continues or Corrects? The US economy is growing at a 3% rate, unemployment rates are low, and US companies enjoy record profits. The global economy is expanding, business economic optimism is high, and US consumers will be seeing a fatter paycheck owing to the new tax policy. And the psychology of the markets (excluding the bitcoin craze) isn’t as exuberant as prior market tops. The tax package may drive the deficit higher and lead to an increase in interest rates. If Europe or Japan start to raise rates or reduce their balance sheets, it could dampen newly found economic growth. 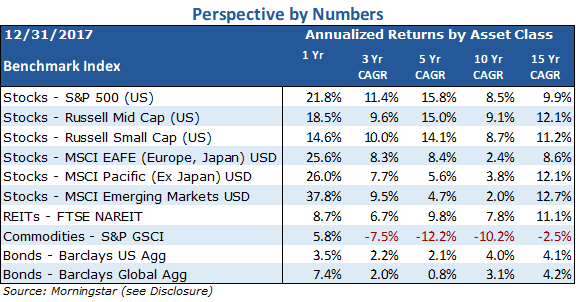 The S&P 500 is now trading at around 18 times forward earnings, which is above the historical average of 16; the CAPE valuation ratio is higher still. Rising global rates, high stock valuations – markets may take notice. The correlation between the economy and the stock market is seldom in perfect sync. There can be significant lags in how the market responds to the economy. Market cycles seldom repeat in a precise fashion. We’ve seen two stock market corrections greater than 50% within the last 18 years. Financial markets will do what they do. Diversified portfolios help buy stability and time to rebalance and recuperate – but they aren’t perfect. How to strategize if we are overdue for a market correction? It’s important to take inventory of your goals and your tolerance for risk. Ask two questions: when do you need the money in your portfolio? How much can you afford to lose (BOTH mentally and financially)? The sole focus in our process is to plan based on your personal financial life cycle. Your goals will change over time, which may require plan adjustments. The only benchmark we care about is the one that helps you achieve your goals without undue risk.